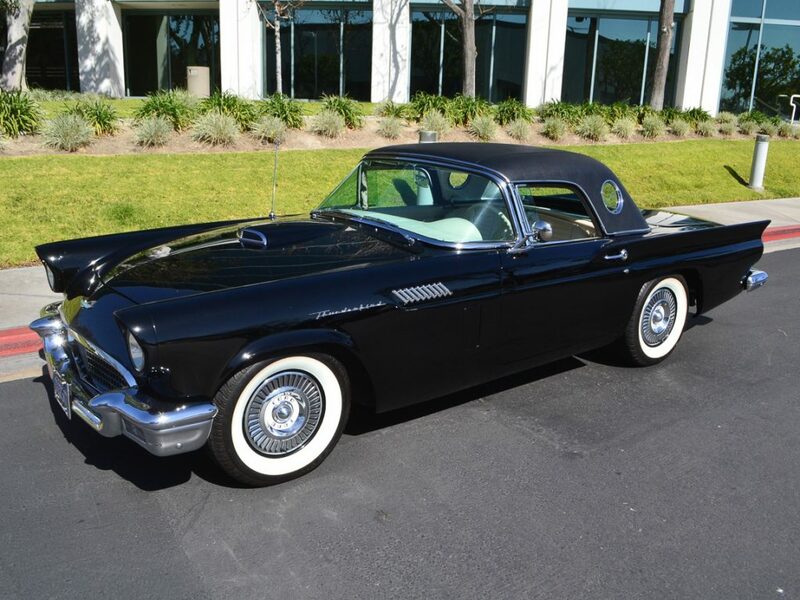 1957 Black Ford Thunderbird Convertible Black w/White interior. For 1957 Thunderbird, the front bumper was reshaped, the grille and tailfins were made larger, and larger tail-lights were fitted. The spare wheel moved back inside the trunk, which had been redesigned to allow it to be mounted vertically. The side “Thunderbird” script moved from the fins to the front fenders. This beautiful example has been completely restored and features a rare 3-spd. manual transmission. It was repainted in Black with White interior, but was originally Bronze w/Bronze interior. Optioned with power steering and both hard and soft tops. It’s an excellent driver that goes down the road straight and smooth. Note: The fender skirts are no longer on the car and are not available.